So I’ve seen some discussion lately about Hallucifer, Sam’s memories of the cage, and what, exactly, Castiel “took” from Sam. We know Sam remembers his time with Lucifer in Hell, all the way up to season 11, and that it was an all-around bad time. So if Cas didn’t give Sam amnesia, then, what happened? 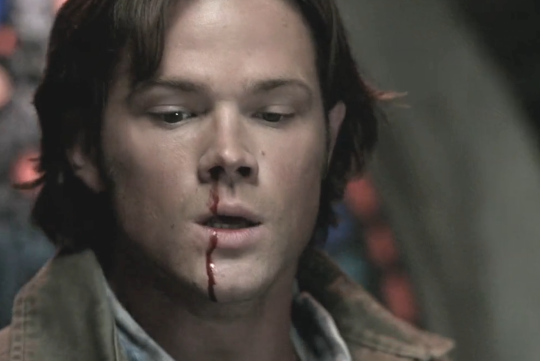 I wanted to point out this scene from 7.01- Sam’s having some flashbacks of the cage and he starts having a nosebleed. Now in television, bleeding from the nose, eyes, and ears is generally associated with psychic exertion. We see these symptoms in people who are attempting to use mind-based superpowers. 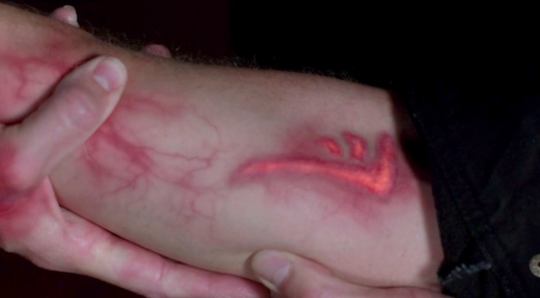 Sam gets almost the same result when he uses his blood-drinking boy!king powers to exorcise Samhain in 4.07. 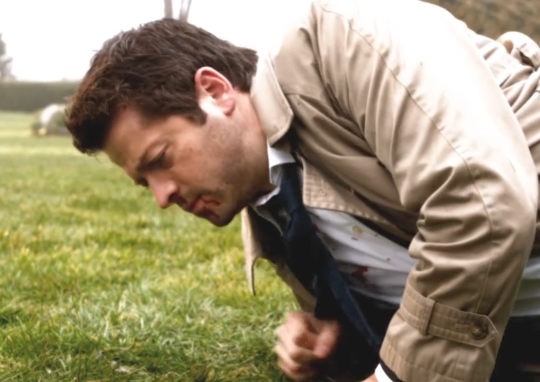 We get it again in 9.11 when Cas is getting Gadreel’s grace out of Sam’s body. Cas bleeds from the nose and mouth after Raphael mojos him in 6.20. Facial orifice bleeding is pretty standard television code for one of two things: The person is using psychic powers, the person is being affected by someone else’s psychic powers. Now, Lucifer isn’t strong enough to send Sam visions until after the cage is damaged in Season 11, but I wonder if it’s possible for Sam to have carried a bit of Lucifer’s grace (and therefore influence) out of the cage with him when he was rescued? It would explain why Hallucifer manifests with distinctly non-mental symptoms such as nosebleeds, seizures, and being immune to prescription-grade sedatives. 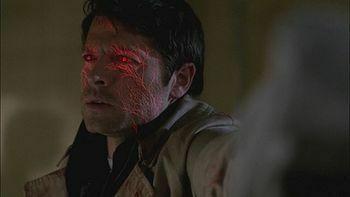 And Dean taking the mark of Cain- another bit of meta-mental skullfuckery that originated in Lucifer. The whole thing with Sam having PTSD and hallucinations in Season 7, it just really made me appreciate Jared’s acting. I was blown away by that whole thing and at the time I wondered where he went in his head to do that because damn. Having had hallucinations my whole life, I kinda glommed onto how well Jared did it. I think the writers meant Hallucifer to simply be a hallucination, which didn’t cut it for me and is why I headcanon it the other way. It’s been talked about before how something is left with the host, and there’s a reason why Sam and Dean are vessels able to hold archangels, and if there was something left over in Sam, it stands to reason that Lucifer would be able to keep that connection even though he’s in Hell and Sam’s topside. Moving on to what Cas took. Since Season 4 I’ve believed that Cas did something to Dean when he pulled him out of Hell, and when Season 7 rolled around I figured he did it to Sam too. It’s my opinion that what Cas took is the damage, the dangerous and destructive part of those years in Hell that would’ve made the guys non-functional topside, and I’m not the only one who thinks this. Being in Hell for so long, both of them should’ve had a shitload more trouble adjusting to being topside again, but when we see Dean in Season 4 he quickly adjusts. Yes, he drinks and has difficulties, but it’s a little disproportionate to the literal Hell he endured, in my opinion. Same with Sam having been shoved into a cage with Lucifer for THAT long. 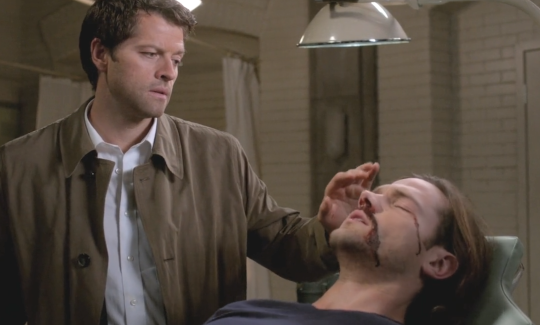 He was messed up, but after Cas “helped” he was disproportionately better given he still has memories. He doesn’t have amnesia. It’s like Cas put a soft cushion around the awfulness, muted those memories, and took the damage himself, sacrificed himself.